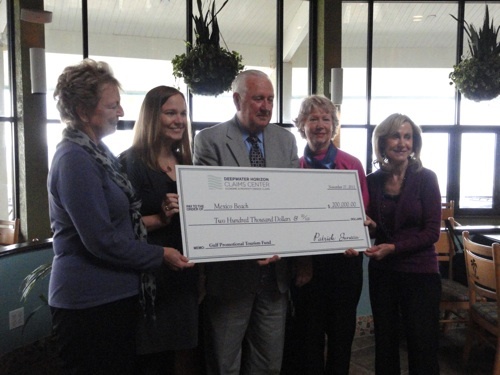 The Mexico Beach Community Development Council was awarded $200,000 from the BP-sponsored Gulf Tourism and Seafood Promotional Fund on Tuesday, November 27, 2012, at Edgewater Beach Resort’s Oceans Restaurant. The funds are to be allocated toward a 2013 turnkey program to increase the online visibility of Mexico Beach across major markets and to spread the news of the beautiful, clear Gulf of Mexico beaches. (L-R) Sandie Yarbrough, Kimberly Shoaf, Patrick Juneau, Susan Howell & Cathey Hobbs. Mexico Beach, which is known as the Unforgettable CoastTM, has continued to grow its tourism and local economy in the aftermath of the 2010 Deepwater Horizon oil spill. 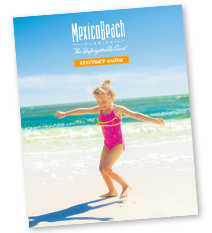 The online marketplace is the most-used resource for travelers looking to gather vacation information, so the new online campaign will not only help bring new visitors to Mexico Beach, but it will also further enhance the local economy in the process. Deepwater Horizon claims administrator Patrick Juneau and grant coordinator Nick Gagliano awarded checks to several grant winners. Representatives from the Panama City Beach Chamber of Commerce, the Downtown Improvement Board-Panama City, the Wakulla County Tourist Development Council, the City of Port St. Joe, the Port St. Joe Redevelopment Agency, and the Gulf Coast Marine Life Center were also recipients of awards from the fund.